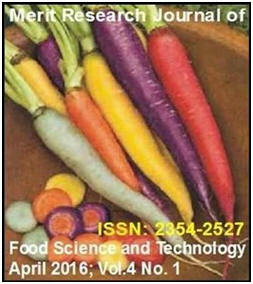 Merit Research Journal of Food Science and Technology (MRJFST) (ISSN: 2354-2527) is a multidisciplinary peer-reviewed journal with reputable academics and experts as members of its Editorial Board. Merit Research Journal of Food Science and Technology (MRJFST) is designed for the prompt publication of peer-reviewed articles in all areas of the subject. The journal articles will be accessed freely online.